Gen VK Singh seems to be frustrated at the situation in J&K. And rightly so. It is ironical that in 15 years, for the first time, the army had to be called out since the police and local government could not tackle local youth armed with stones and sticks! He rues that the opportunity provided to the local government has been frittered away. What is he apprehensive about? He is apprehensive about the fact that the valley is again slipping out of the hands of the local government. That it will take another cycle of violence and counter-insurgency operations to restore peace – the likes of which over the past few years has been encouraging. These operations will cost lives of soldiers, officers and civilians – avoidable had the government engaged the local population. For the record – the stone-pelters are frustrated youth – frustrated with the inability of the state government to provide employment. Frustrated with the audacious corruption within the local government. Frustrated with a Chief Minister from whom they had many expectations and who now seems to have run out of ideas and is weighed down by his ancestral baggage, unable to step out of his father’s shadow, unable to bridge the gap between him and his people. Frustrated with local politicians who are exploiting these youth to convert the anger into a petty political brownie point – at the expense of the dead protestors. Observers would have noted that the Army during the flag marches in Srinagar, did not face a single stone. And this was nothing to do with the ‘curfew’. 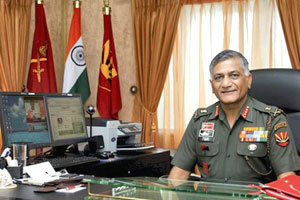 It is to do with the reputation of the army as a clean organisation – notwithstanding the fake killings. The fake killings are an aberration with very few such cases actually having taken place, given the quantum of troops deployed. The fact is that the army with its phenomenal efforts in terms of Operation SADBHAVNA and Winning Hearts and Minds (WHAM) is the only organisation in Kashmir which is considered reliable. It may be accused of being strict and ruthless – but it operates with professional ethics and keeps in mind the sentiments of the people. Let us hope Mr Omar Abdullah arises from his stupor, dismounts from his historical high horse, faces the facts on the ground and acts. He is capable. Only if he tries. The ball squarely lies in his court. The Chief can only express his regret. This entry was posted on 12 July 2010 at 4:41 PM and is filed under Army, Indian Army, Insurgency, J&K with tags COAS, lost chance, Omar Abdullah. You can follow any responses to this entry through the RSS 2.0 feed. You can leave a response, or trackback from your own site. Omar Abdullah was Rahul Gandhi’s choice and the fact that Gandhi has kept mum till now goes to reveal how Omar has lost credibility even to those who thought he was the man for the job. We must remember that at the time of J&K elections ’08, Omar had NOT been projected as the candidate for CM’s post. In fact, most thought (and even voted) with his dad in mind. Having said that, one gets a feeling that we somehow managed to scrape through the Amarnath land crisis but this one looks bigger and here the anger is were utilised. The ball now squarely lies in his court. Mr Omar has to decide how he wants to be go down in the annals of history – as an also ran, or as one who ran the state to it’s rightful place in history – long overdue. I absolutely agree with what the Army Chief has said. His observation is correct , acurate. and professional. However the problem is who wants to follow a professional counsel in this country. We want to gag any person who has got some thin to say. Any way nice that the Chief has said it. The Chief is only being what he is – a soldier. Let diplomats and politicians hide behind the obfuscations and semantics. The Chief has to perform simply because he leads the Weapon of Last Resort. It is not just in J&K. Same situation is there in North Eastern States where the peace won at the cost of lives over so many years is being frittered away by politicians, bureaucrats & police in their never-ending greed. Endemic corruption at all levels has led to almost total siphoning-off of development funds & lack of governance & development. No wonder the insurgency there is never-ending – the common man doesn’t find his needs being addressed & the Army has to keep stepping in to recover the situation lost by the politicians & bureaucrats. We, at ISM, feel that the change must come from us – from within. We are doing our bit spreading awareness. Presently that is all we can do.